I’d estimate that 90% of the guitar issues people write to me about could be solved by simply getting what’s called a basic “guitar setup.” Experienced guitarists already know what this procedure is, and how vital it is to making our guitars play their best. Some guitarists (like myself) do our own setups. However, until you know what you’re doing, it can be a long, frustrating process to try and tackle on your own. This is why most people opt to have setups done by a music store or guitar repairperson instead. What Goes Into a Guitar Setup? StewMac Fret Rocker Tool: For checking frets for high spots. StewMac String Action Gauge & Ruler: For measuring string height. Notched Guitar Radius Gauges: For setting bridge saddles to match fingerboard radius. Fender Guitar Workstation: For safely supporting the guitar during work. ESP Multi Spanner Wrench: Guitar multi-tool for a variety of uses. DeoxIT D5 Spray: For cleaning guitar electronics. Big Bends Nut Sauce: For lubricating the truss rod nut, and other moving parts. StewMac Digital Caliper: Unnecessary, unless you plan to seriously get into guitar repair. Is Your Guitar Set Up Properly? As you can see, quite a lot goes into getting your guitar properly set up. 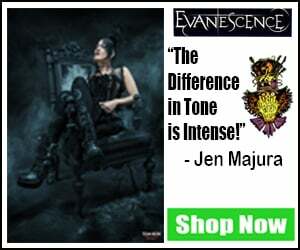 Ordered your guitar online? Chances are it probably needs a setup. Not many new guitar owners understand that mail-ordered guitars rarely arrive properly setup. Even if the sender claims they setup the guitar before sending, the rigors of shipping tend to knock things out of adjustment. Best to take it to a pro for a good setup so that it plays and sounds its best. Really, the only time a brand new guitar is properly setup is when you buy it in-person from a good music store. I say “good music store” because there are still a few stores out there that don’t setup the guitar as part of the sales process, which I consider to be sub-par customer service. Most stores, however, will include a full setup (and usually a fresh set of strings) as part of the purchase price. Want to Learn to do Your Own Guitar Setups? 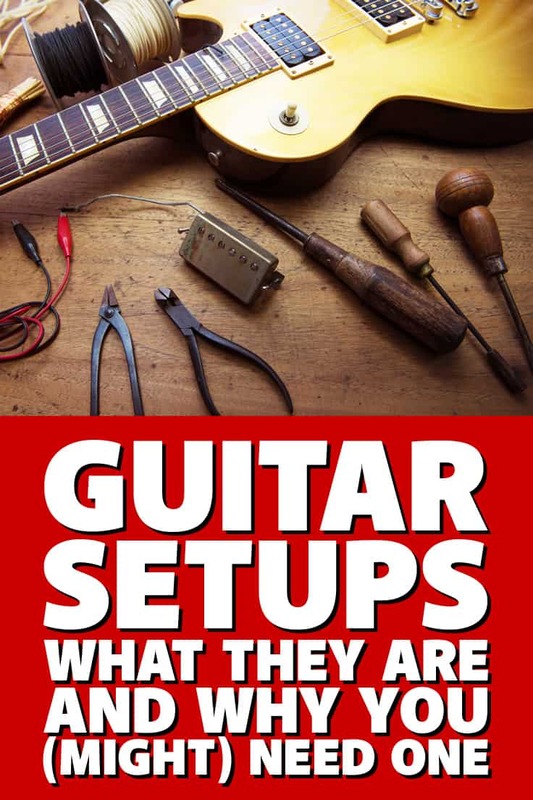 If you’d like to learn to do your own guitar setups, there are a few good books I’d recommend. The only question is: how deep do you want to dive into the topic? Do you just want straightforward, no-frills info on how to set up your guitar? Or, do you want to dive deep into the world (my world) of guitar care, repair, and maintenance? 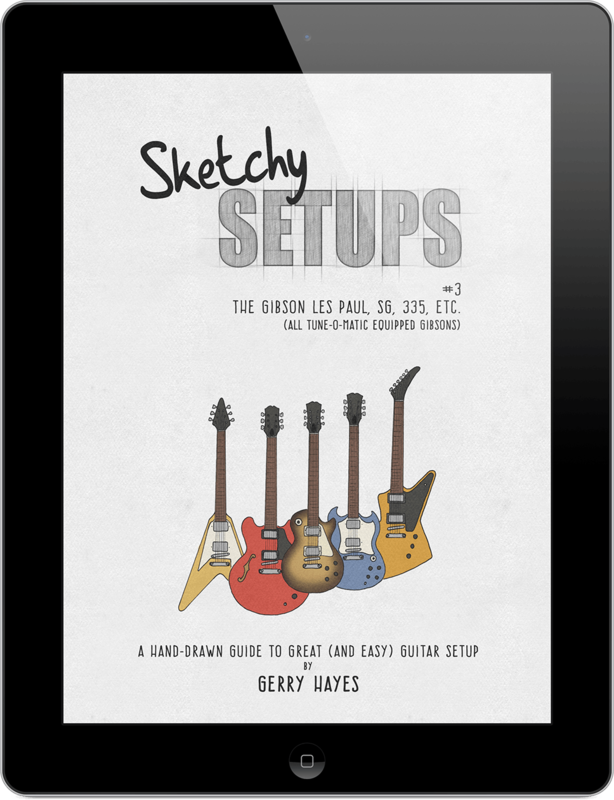 For those of you who just want concise, to-the-point instruction on how to set up your electric guitar or bass, I highly recommend “Sketchy Setups.” Written by master luthier Gerry Hayes, these downloadable e-books contain only the information you need to get your guitar or bass setup and playing great. Their whimsical style and plain language makes them actually fun to read. For those of you who want to dive in… beyond just setups, there are two books that I recommend. These are the books that got me started back in the 90’s, and they’re the ones I still refer to today. These are the best in-depth books I’ve found, and they’re definitely not “light reading.” Buy these if you’re a big guitar repair geek like me, or are considering offering guitar tech/repair services professionally. 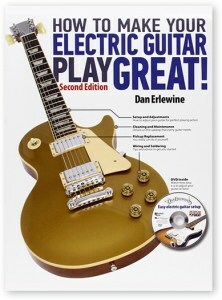 This book covers just electric guitar setups and some basic maintenance. 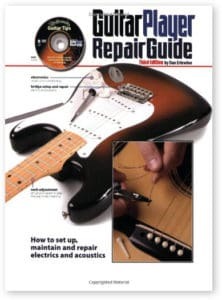 It’s a bit leaner than the book below because it doesn’t cover acoustic guitars, and doesn’t venture as far outside the core topic of electric guitar setups (but does briefly touch on other basic care, maintenance, and repair topics). Includes DVD. This is the grandaddy of guitar care and repair books. As the title implies, it’s a compendium on everything from maintenance to setups to serious repairs. This one is way more in-depth than any of the books above, and it also covers acoustic guitar setups. I bought my first edition back in the 90’s, and have bought every subsequent edition thereafter. Includes DVD. Combine what you learn in those books with the tools listed up above, and you’ll be well on your way to becoming an ace at doing your own setups. I also created a comprehensive list of guitar setup tools here. Just be patient–there is a lot of “feel” involved in doing guitar setups, and it can take some practice before you start to get the hang of it. If you plan to experiment with serious techniques like fretwork, painting, repairing finishes, etc. please PLEASE buy cheap, old guitar necks and bodies to practice on. Don’t “practice” potentially destructive techniques on any guitar that you care about. I’ve seen old guitar necks on ebay for as cheap as $20. I’ve seen old guitar bodies even cheaper. Do you do already do your own guitar setups and, if so, where/how did you learn? Let me know in the comments section down below. Thanks especially for that video. I’m glad he also mentioned the items they would do for an acoustic. I’m guessing they would do basically the whole list for an acoustic-electric. Hi Gary. Acoustic-electrics follow the same core setup process as an acoustic-only guitar… at least when it comes to neck relief, action, intonation, etc. The only difference is that the piezo system and electronics may occasionally need a little maintenance, but otherwise there’s very little difference. Thanks. Great video, imo you couldn’t have used a better video…phil is very knowledgeable and love his live streams. Phil’s old music store… McKnight Guitars… was literally 5 minutes down the road from me here in Chandler, AZ. Unfortunately, it closed before I could really get to know him, otherwise we might’ve collaborated on something (possibly a video).